Today 3D printing is certainly one of the most successful technologies. Perhaps this is because DIY 3D printers are now available at prices to suit everyone’s pockets and the quality of desktop printers has improved remarkably. 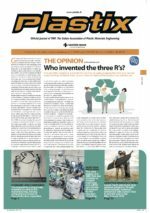 Perhaps it is because the market is increasingly drawn to consumer-oriented solutions, or because the stringent demands of the industry include the rapid creation of a functional prototype at lower costs, but also the production of small batches of ready-to-use parts. These are the current requirements and trends, and they are ones that the producers of 3D printing technologies and materials, by turning out increasingly flexible, sophisticated and affordable solutions, are seeking to satisfy – and in some cases anticipate. This also applies in the field of polymers, where the real challenge is to find alternative solutions for manufacturing products similar to those made from traditional plastics. The 3D printers we are referring to here use the additive manufacturing technology, in which objects are created from layers of material. This technology is cheaper than traditional ones to produce plastic objects, because all that is needed in order to generate them is an STL file, i.e. a file obtained from a CAD program. This means that the production process can get under way as soon as the design stage is complete, without the need for prototypes, molds or traditional plastic processing systems. In a way, the prototype and the final product (created by the 3D printer as a single piece, without the need for assembly) are one and the same thing. Working without molds not only cuts costs, it also means that the manufacturer is free to create all kinds of shapes, and above all, is not restricted by the rule of “large numbers”. 3D technology, therefore, is a celebration of personalisation, but also of flexibility and shorter times to market. And this is because, using a file, it becomes much easier to manage the many changes that can be requested before arriving at the final product. The undisputed pioneers of 3D printing include companies such as Eos, Stratasys and 3D Systems, all of which have, for years, been involved in the development not only of printers but also of materials. This latter segment is witnessing the emergence of growing numbers of plastic materials. 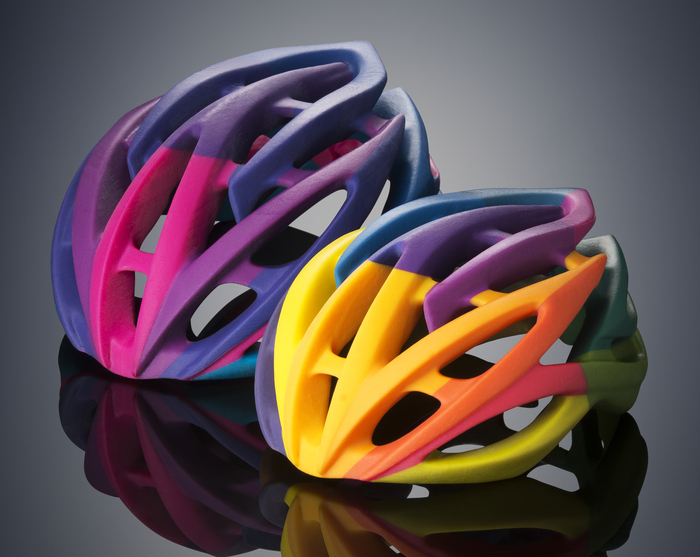 The Stratasys range, vibrant and ever-increasing, already includes almost 150 grades. 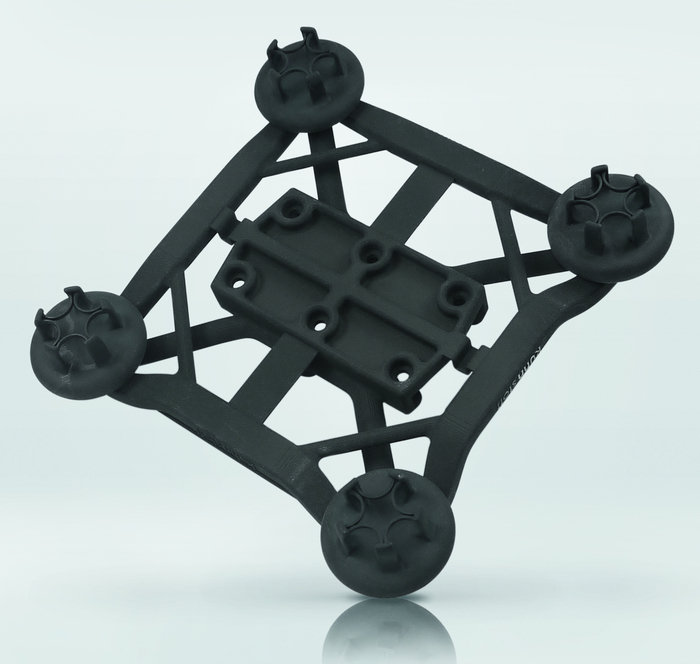 At the start of this year, for example, Stratasys started marketing FDM Nylon 12, a material that, together with the fused deposition modelling (FDM) process, can be used to produce unfilled nylon parts that are stronger and more flexible than those that can be obtained using other additive manufacturing technologies. 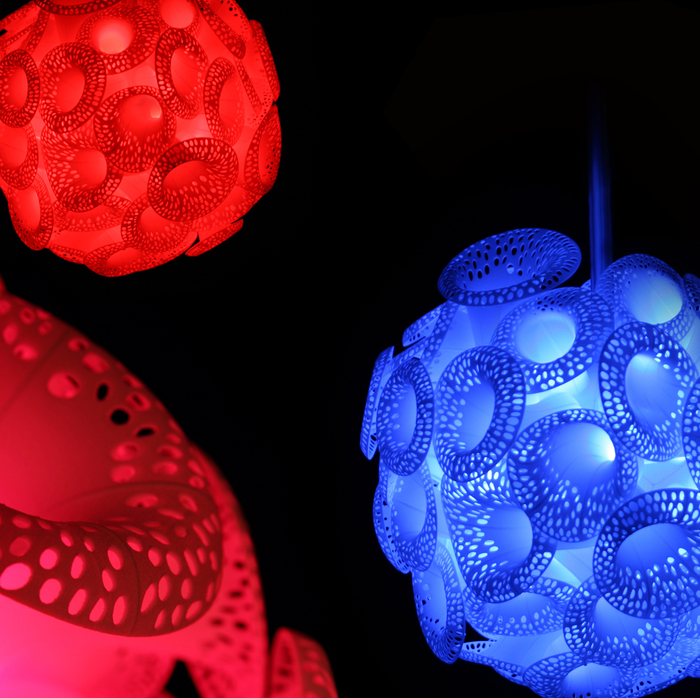 Around 20 days later, the company announced the imminent launch – planned for the summer – of six new colour palettes, matt and transparent, for flexible materials, which will make it possible to maximise the performance of the new Objet500 Connex3 Color Multi-material 3D Printer (also launched at the end of January 2014), the first 3D printer with the capacity to produce coloured, multi-material parts that are realistic-looking and whose features and appearance are similar to those of their plastic counterparts. Stratasys has used the latest trade fairs in which it has taken part as an occasion for unveiling the interesting opportunities offered by the use of 3D printing for making plastic molds that can be used in injection molding. These molds are suitable for small-scale production runs given that, as well as costing less, they are also quicker to construct (2-6 weeks) than steel molds, whose lead times can instead last months. The potential of 3D printing was recently highlighted by Eos through a case study conducted in collaboration with Kuhn-Stoff (German designer and developer of prototypes) after Wittmann Robot Systeme (the German subsidiary of the Wittmann group which produces automated systems) asked the latter to redesign a mechanical gripper equipped with a pneumatic mechanism for lifting, transporting and positioning mechanical pieces on a production line. The existing version of the gripper was made up of 21 different components in aluminium, rubber and plastic, and it was expensive to produce. Wittmann Robot Systeme was therefore looking for a simpler, more economical and lighter alternative. Using Formiga P 100, an Eos 3D printer, Kuhn-Stoff developed a new version comprising just two types of component, both made from plastic: a square-shaped central body with four identical washers placed one at each of its four corners. This new version, which weighs barely 220 grams, is 86% lighter than the previous version; furthermore, it is produced in a quarter of the time and costs only half as much. Despite this, the new gripper is just as strong and durable as the previous version, and can go on transporting the required loads for more than 5 million operating cycles. «In a single step we have succeeded in creating a functionally integrated part, even exceeding our client’s requests – remarks Hannes Kuhn, CEO of Kuhn-Stoff –. ln short, even though additive production is now a part of everyday life, the results it gives continue to be extraordinary». 3D Systems has developed the small 3D Cube printer to print 3D objects directly at home or in the office. Affordable, intuitive and ready to use – to begin using, simply plug in. It has a software package pre-loaded with 25 printable objects by Freedom of Creation’s Designers. It has a Wi-Fi connection that directly connects the computer and the Cubify software to create or convert your projects. 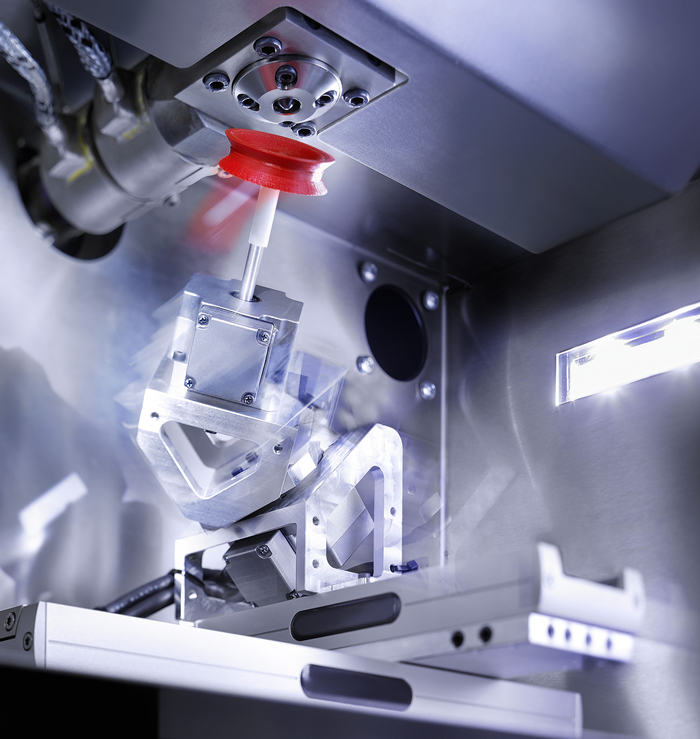 The size of an office coffee machine, Cube presents numerous possibilities for do-it-yourself 3D experimentation and several new opportunities in the field of rapid prototyping. «It primarily targets the consumer market – explains Alessandro Buson, Quickparts Europe marketing manager –. It can be purchased from our retailers or online from the Cubify website, a division of 3D Systems and innovative web platform where designers can also see their objects or prototypes. The basic version of the 3D Cube, which moulds BLS and PLA plastic, can process up to two materials and print a single colour at a time, while the CubeX model uses up to three materials and can print a number of colours at the same time». One of the current limits of 3D printing is that the technique is compatible with only some of the available plastic materials, which, in order to be used for this purpose, must have certain properties. For example, they must be capable of melting to a consistency that allows them to be deposited through a nozzle similar to the kind used in ink jet printers and they must also be fast drying. To date, it has been necessary to develop, at some considerable cost, plastic materials designed specifically for use in 3D printing. Some plastic materials, such as quick-drying silicone sealants used for sanitaryware, intrinsically possess the right combination of properties and the possibility of using 3D printing technology in combination with the most common types of plastic resin (as those used in conventional processing techniques such as injection molding), would allow this technology to take a real quality leap forwards. What is more, a further expansion of the possible applications of 3D printing would open up the way for its use in the manufacturing of commercial products, in addition to prototypes and molds. This is the direction Arburg, a German leader in the production of injection machinery, has taken, despite never having shown an interest in 3D technology until a few months ago. At the most recent K, it launched the world debut of a new technology, called “freeformer”, which processes traditional plastics. The machine’s operating principle is substantially the same as an injection press, in as much as it uses a heated plasticising barrel to melt the plastic granules. A patented nozzle then feeds the plastic melt using a high frequency piezoelectric device for rapid opening and closing. The nozzle places drops of the melt on a work surface under pressure, manufacturing the final item one drop at a time. Arburg claims that the mechanical strength of plastic products created using this moulding process, called “Plastic Freeforming” by the company, is equal to approximately 70-80% of pieces produced with traditional injection moulding techniques. In addition to Arburg, other companies in the plastics world are beginning to explore 3D printing technology. The producer of styrene monomers and Styrolution polystyrene, for example, has recently launched a joint research programme with Hans-Werner Schmidt, Director of the MacroMolecular Chemistry Department at the University of Bayreuth, Germany. The great advantage of combining styrene resins with 3D printing lies in the fact it is not hard to chemically modify styrene and combine it with other polymers, thereby giving life to a wide range of styrenic plastics with diverse physical properties. In addition, the surface of styrene polymers can easily be customised to add particular features, such as anti-bacterial and soil-resistant properties. 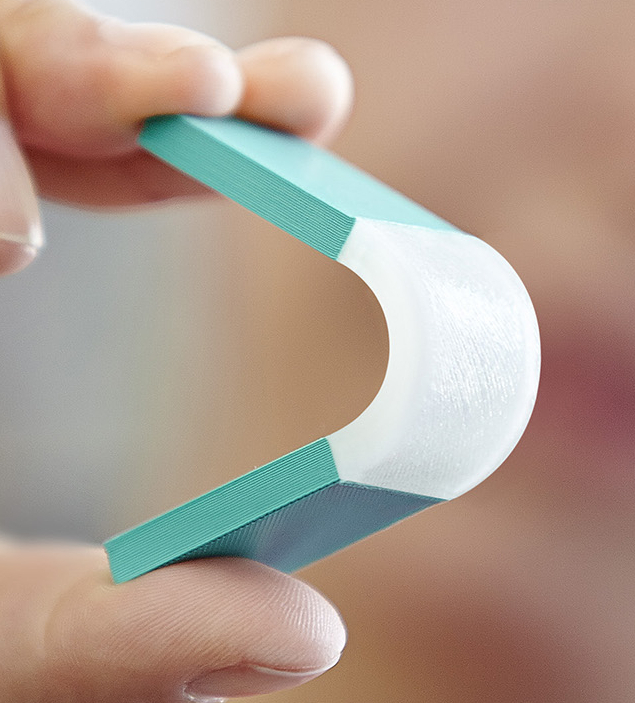 «We believe that 3D printing is a real revolution destined for wide distribution in the future – director of the global R&D and intellectual property division at Styrolution, Norbert Niessner, explains –. Personally I believe that this technology will revolutionize the way the sector produces prototypes, because we want to advance partnerships with our clients to supply them with the most suitable materials». Innovation in the world of 3D printing is advancing rapidly, but despite being a recent development, there is a new technology that encompasses – and virtually supersedes – the additive manufacturing techniques: 4D printing, the fourth dimension being time.